We have four cottages, each equipped to a very high standard. Two sleep up to four people, while the other two sleep up to three. Prices range from £400 to £550 per cottage per week, though we may have special offers available in the off-peak season. See our rates page for full details. These cottages are semi-detached units. We allow one pet in Kishorn, while Bealach is a pet-free. Both have superb views. From the dining room you can watch Calum as he passes on his popular seal trip or just enjoy the panoramic view of Loch Kishorn and the Applecross Hills. Picnic tables are located at the back of the cottages, which also have open and superb outlooks towards the Bay and the Crags. These cottages have two bedrooms. Bealach has one with a double bed, the other with two single beds. Kishorn has one double and one single. The living room, dining and kitchen areas are all open plan and the bathrooms have a bath with an electric shower. The main living area is equipped with TV and a mini stero with CD player. A good range of paperbacks is also supplied. Heating is by electric storage/convector heaters. There is also an open fire and fuel (coal) can be supplied by the proprietor. The kitchen is equipped with a four-ring cooker with oven, microwave, fridge and dishwasher. The cottages are fully equipped including bed linen and towels for up to four persons. Coin-operated washing machines and a tumble dryer are located in a separate building. 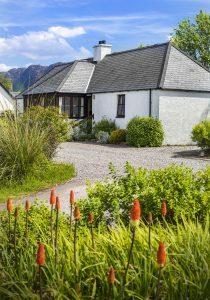 Reraig cottages is semi-detached. Reraig is pet-free. Reraig has superb views. From the dining room you can watch Calum as he passes on his popular seal trip or just enjoy the panoramic view of Loch Kishorn and the Applecross Hills. Picnic tables are located at the back of the cottages, which also have open and superb outlooks towards the Bay and the Crags. Reraig has two bedrooms: one double and one single. The living room, dining and kitchen areas are all open plan. The bathroom has an electric shower. Heating is by electric storage/convector heaters. There is also an open fire and fuel (coal & wood) can be supplied by the proprietor. Reraig is fully equipped including bed linen and towels for up to three persons. Coin-operated washing machines and a tumble dryer are located in a separate building. One room has a double bed and includes a TV, the other with two single beds. The living, dining and kitchen areas are all combined and the bathroom has a full-size bath and shower. The cottage is all electric. The main living area is equipped with a combination TV and VCR and a mini stereo with CD player. A good range of paperbacks is supplied. The kitchen is equipped with a four-ring cooker with top and main oven, microwave, fridge and dishwasher. The cottages are fully equipped including bed linen and towels for up to four persons. A coin operated washing machine and a tumble dryer are located in a separate building. Off-street parking is available for all cottages.